Through their leadership and organization: Worship leaders help shape the church through leadership and organization. No matter if you are full time are part-time, you have the opportunity to help create moments in worship where people experience God. And you help provide the needed organization so that the congregation can use their gifts in ministry while serving on worship teams. Through their questions: Worship leaders can ask questions to help shape the church. What can I do to help? What is our main goal? Do we need to do this? Why are we doing this? What can you tell me that would help me improve my work? A teachable worship leader is important. 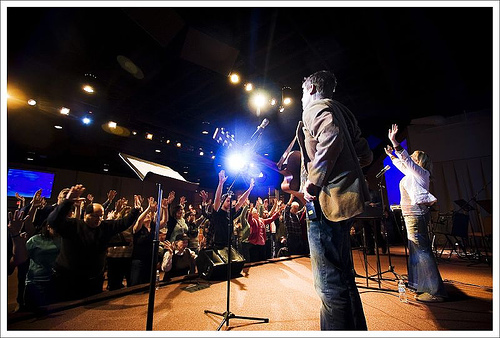 Through their prayers: Worship leaders are pastoral leaders in the congregation. Pray for your people, for the teams, for the pastor and for the ministry. Through their planning: What sacrifices are you making so that you are planned? Planning doesn’t mean that you leave out the Holy Spirit. The Spirit can work through planning so the right words, the right songs and the right moments to happen anytime in the future. Planning gives time for creativity and preparation. Each of these areas are crucial for worship ministry and it help develop a culture of growth in the church. Through their attitude: A great attitude is always a church shaper. If you are confident, happy and friendly then you attract people around you in the name of Jesus. We want to model Christ’s love to people. We need to be supportive of the pastor and church leadership and we need to be happy to be called to this church in this role for this season! Stay positive and ready to serve. Through their ability to develop the next generations of worship leaders: In 60 years, you won’t be leading worship from the stage. But someone will. Who are you developing to be a future worship leader? In what ways do you give people the opportunity to develop their gifts for ministry?